At Dish, I worked on a team that focused primarily on the internal (employee facing) order entry tools for the call centers. I was responsible for the UX and UI design for the call center app which took new customer orders/registrations. 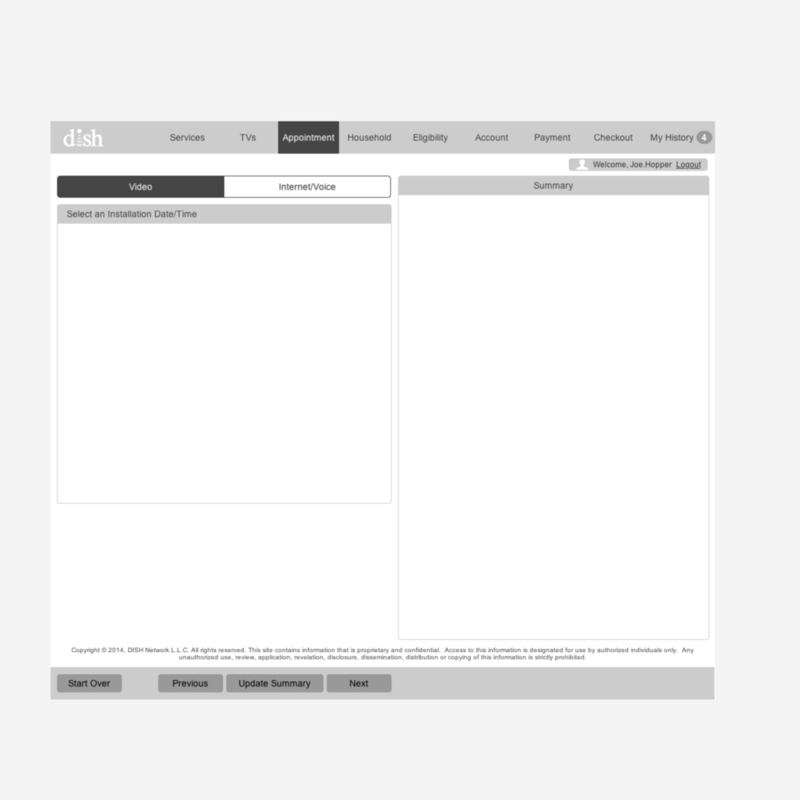 Toward the end of my time at Dish, we were tasked with a redesign of the entire app and were to make it responsive; a feature that was not present on the current version. The Axiom 1.0 product was starting to show signs of age. The product was not mobile responsive and some of the agent workflows were starting to introduce roadblocks that lead to increased call times. Call center team leads are always on their feet; bouncing from agent to agent when needed. Having the ability to modify and override orders without having to make a trip back to their desktop computer would be huge! This specific requirement was not a requirement from the product team until we as a team took the feedback that a large majority of agents would like the ability to be mobile while taking calls. This change in requirements drastically changed our project timeline and deliverables. Not every call is the same. Some agents like to start with their sales pitch or with the free offers the customer was qualified for.... Sometimes the calls were customer driven; the customer only wanted to purchase if Dish had their specific channel or package available. Call center agents are staring at their screens for 8-10 hours a day. One of the major new requirements for version 2.0 of the Axiom product was to make it mobile responsive. We knew the main subset of users of the new app were going to be the agents taking the calls, with a secondary subset of users being the supervisors. Some of the questions we asked ourselves prior to even digging into the research were: Do the regular agents need their tool to be responsive as well? Do the supervisors sometimes take over calls and need to be able to create orders from scratch? Or would they be okay with only having access to the modify order/override order? So we set off. We scheduled many local call center visits and even made it out to a few call center locations that I hadn't been able to make it to during my normal contextual inquiry trips. I held group Q&A sessions prior to sitting down and card sorting or observing any of the users. I asked the users what sort of features or items were missing from Axiom 1.0, as well as any general feedback or complaints they had. We had the agents first do open card sorts with no limit on the number of categories (piles of stickies) of pre-defined existing Axiom 1.0 features we had placed on sticky notes. I shadowed and Y-jacked into the calls with dozens of different agents from different departments, all of whom had different types of experience, age, as well as non-English speaking agents. While observing, I was noting patterns, consistent error flows, environmental distractions, etc. There were patterns in the type of sales tactics used, which helped us create flow diagrams later for the three agent types we created as Personas. The new flow needs to allow for the ability to jump around from screen to screen and not follow a sequential e-commerce shopping cart experience. 70% of the calls start off as agent driven conversation and quickly evolve into a customer driven call. The customers primary concerns were always what offers they qualified for and if a certain package was available in their area. Agents want the ability to pull in DirecTV, Comcast, and other local competitors deals into the axiom UI to use as negotiating leverage. Disclaimer: Low Fidelity wireframes were not utilized for this project due to the project timeline. The team jumped straight into Axure RP for low fidelity digital wireframes. Working with an offshore development team that didn't specialize in front-end development, we knew we were going to face a challenge in terms of UI consistency and communicating the specifications under a tight deadline. The onshore development manager and the UX team decided on a framework that already had most of the styled components we would need for Axiom 2.0. We chose Bootstrap 3 due to its documentation and readily available "plugins". Plan for mobile, even if a smaller percentage of your users are mobile. The Axiom 2.0 app design set Dish up for several years of future-proofing by making the app responsive and using a framework that was actively supported by the tech community. Using a framework and not making our own components saved on time during all phases of the project. Not focusing on the UI "polish" really allowed us as a team to focus on the interactions and really nail down the order flows. Having a rigid backend didn't allow for as much flexibility on the front end in terms of opening up the ability to take credit/card and social security numbers prior to selecting programming. This was a small use case, and primarily only affected the supervisor position.